acon Industrial mSATA delivers all the advantages of flash disk technology with the Serial ATA Interface and is fully compliant with the standard mSATA form factor, known as JEDEC MO-300 standard. The power consumption of the mSATA is much lower than traditional hard drives, making it the best embedded solution for new platforms. acon Seal mSATA products will be fully coated with a special sealing compound, which hermetically seals the sensitive electronic components within and protects your data reliably against liquids, dust, dirt, shock and vibration. acon Seal mSATA delivers all the advantages of flash disk technology with the Serial ATA Interface and is fully compliant with the standard mSATA form factor, known as JEDEC MO-300 standard. Apacer Technology has recently launched a brand new ultra slim industrial SATA3.0 SSDs: SU120-300, compliant with the MO-300 standard. This model made by SLC-lite flash extremely competitive for its ultra slim appearance, high speed, high stability, and wide temperature operation for industrial uses. 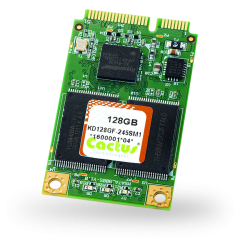 The Cactus mSATA (aka Mini-SATA and MO-300) products are designed to the industry standard JEDEC MO300B and SATA-IO group’s specifications. They are intended for applications which demand extremely high performance and medium endurance in a rugged embedded foot print guaranteed to MIL-810 Standard shock and vibration. Innodisk mSATA 3IE3 effectively reduces the booting time of operation system and the power consumption is less than hard disk drive (HDD), and complies with ATA protocol, no additional drives are required, and can be configured as a boot device or data storage device. StorFly® mSATA (MO-300) SSDs are optimal storage solutions for medical, networking and embedded applications that require high performance in a small form factor. StorFly mSATA offers a superior solution for system designs that implement SATA connectivity over a widely-used socket that has the added benefit of industry-standard clamping mechanism, making them ideal for wearable or vehicle computers and other high shock and vibration applications. in many military and ruggedized portable computers and data recorders.